This month has been a crazy one! From taking on new opportunities, participating in my normal organizations, and juggling my classwork I have been extremely busy. But, I have a few favorites from the month of February. Budweiser Super Bowl Commercial | This commercial may be one of my favorites of all time! I can't get enough of the adorable puppy, horses, and the song in the background. The song "I'm Gonna" is also a top favorite of the month. For a while I listened to it on repeat while I walked to class. Scarves, hats, and gloves | The cold weather has hit Ames hard! Since I walk everywhere I normally bundle up with multiple cold weather accessories including scarves, hats, and gloves. My current favorites are my touch screen gloves from Target, my J Crew infinity scarf, and my Juicy Couture ear muffs. Sweet Tart heart suckers | During the month of February, I consumed a lot of candy! 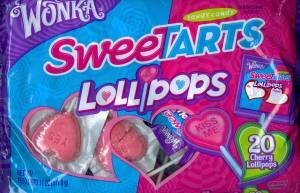 My top favorite treat for Valentine's day is for sure the sour Sweet Tart heart shaped suckers. They are an equal addiction to the carmel apple suckers in the fall! Gossip Girl | Surprise, surprise, I started Gossip Girl again on Netflix. I started it about a 2 weeks ago and I'm already on season 3. It truly is an addiction. But, non the less its still great even after watching it for the third time. Highlighters | As odd as this might sound, highlighters and Papermate pens have saved my life this month. I have had 4 tests so far this month so color coating is crucial. Those are my current favorites of February! Although it has been a busy month things are continuing to get busier! Be on the look out for more posts soon. 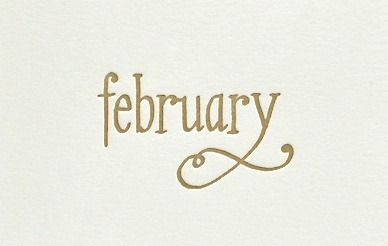 What have been your favorites of February? Let me know in the comments! 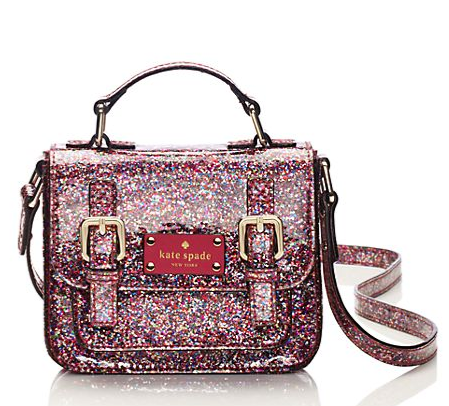 Kate Spade has done it again! 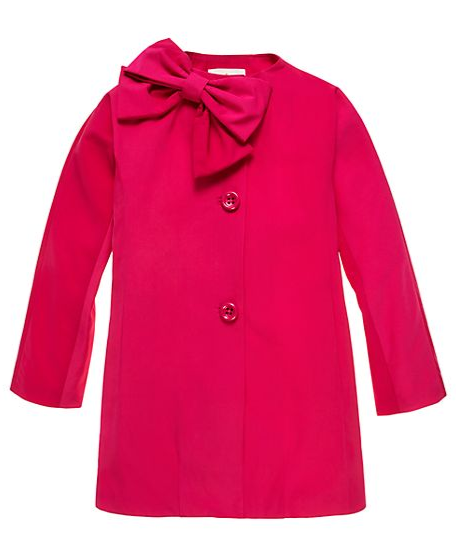 I have been dreaming of a Kate Spade kids line for many reasons. 1. When I'm a mother I want to dress my kids in head to toe Kate Spade and J Crew. 2. I still fit in kids clothes so basically I get Kate Spade items for less. 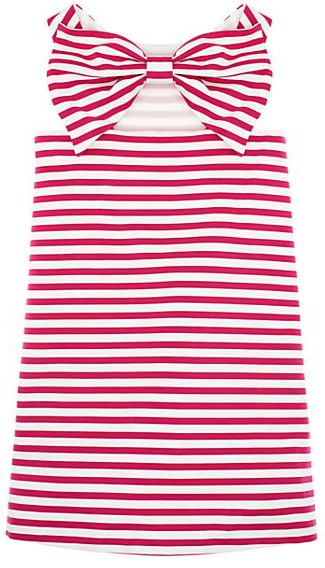 3. Who wouldn't love mini versions of our favorite Kate Spade pieces? No one! The new line features adorable dresses, skirts, t-shirts, accessories, and one fabulous pink coat! 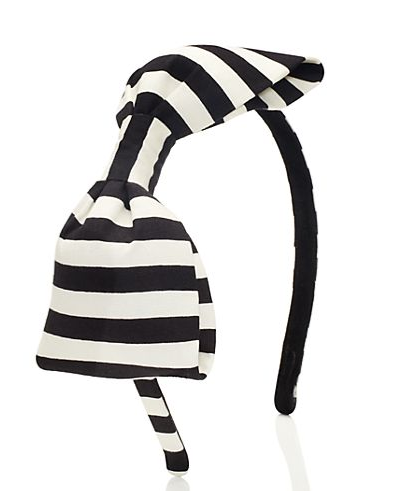 Not only are these mini replicas of Kate Spade's women's line but they have some fun special pieces just for kids. I am lusting over the little mini bags they offer. 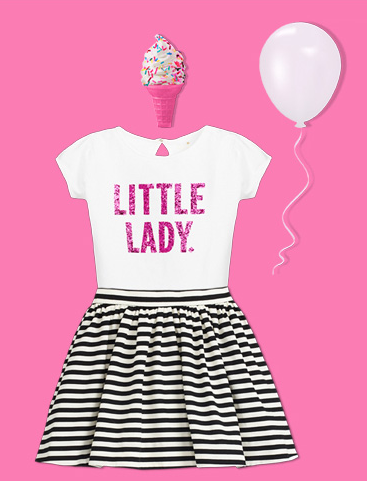 From glitter, stripes, to solids they have one for every little girl. I am highly considering purchasing one for a little cross body to carry around campus. These two dresses are darling! I am highly considering purchasing them..... The back of the striped dress is too cute! 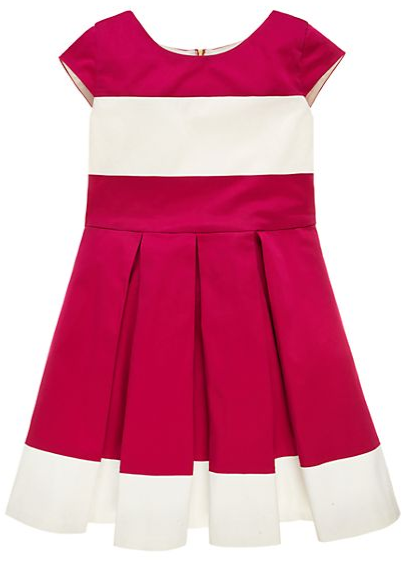 Then the classic pink and white pleated dress would be great for a more formal event. This skirt and coat.... I can't get enough of them! The mini Dorothy jacket is a must have for any adorable little girl. 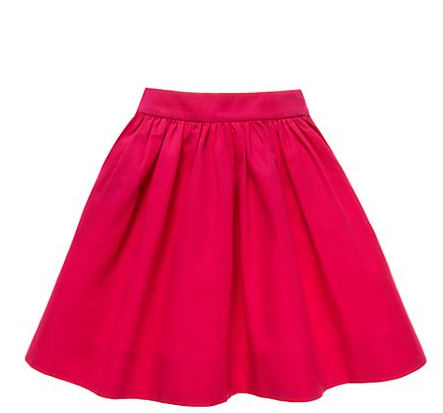 Also, this flare skirt is a great piece to dress up or down. I could picture it with a cute t-shirt or with tights and ballet flats for a dressy occasion. What little girl wouldn't love these two accessories? You can never go wrong with an oversize bow and a little glitter. What are your favorite pieces form the collection? Let me know in the comments! 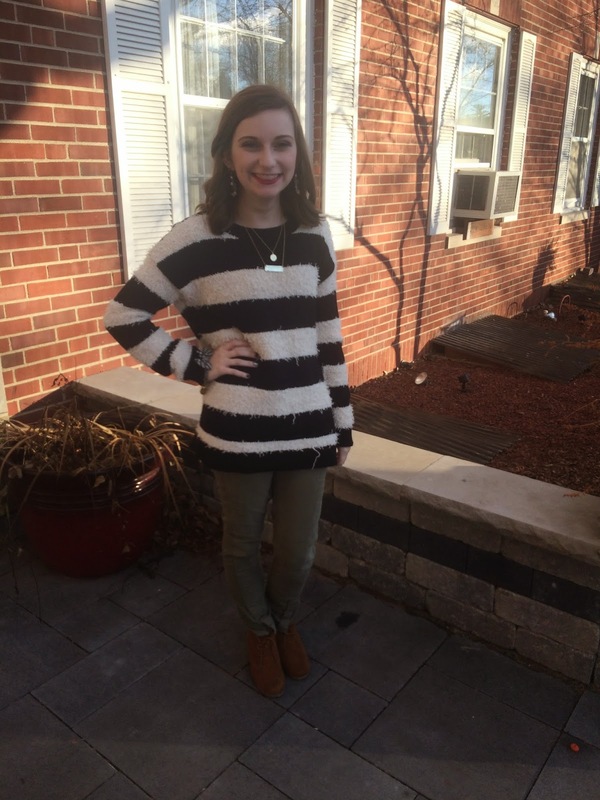 For this outfit of the day I was a little more dressed up then normal. To create this preppy look I first wore this gorgeous embellished oxford. Originally around $90 at J Crew I got it on sale for around $25 on clearance! It was such a great deal that I could not pass up. The shirt has a fabulous sequin detail down the side which gives the shirt a glam touch. I paired the shirt with a simple navy skirt. To keep my legs warm on the chilly day I wore thick sweater tights. To accessorize the look I wore a gorgeous multi-colored statement necklace. 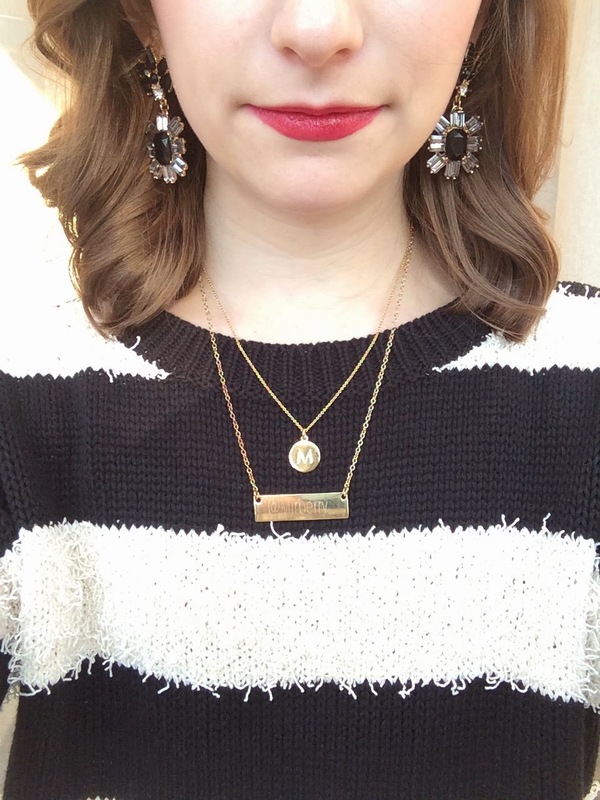 I also scored this necklace for under $20 at J Crew! My number one shopping tip is to take advantage of the sale section at J Crew. Most often times they have an extra 40%-50% the sale section. In addition, to my necklace I also wore subtle iridescent statement earrings. To complete the look I wore Daniel Wellington watch and a Henri Bendel bracelet. For a change in my watch, I switched out my leather strap for my navy and red nano strap. I love Daniel Wellington watches because it gives you the option of changing your strap to make it a completely new watch! I'm currently LOVING this oxford! The sequin and ribbon detail makes the shirt a little more special then your average oxford. How do you style an oxford? Let me know in the comments! Valentine's Day is right around the corner. So, if you have some last minute shopping to do, here are some great gifts to pick up for your sweetie! Although this isn't my favorite holiday, I think buying gifts for friends or family is actually fun for Valentine's Day. So you may not have a boyfriend or a significant other. But, you can still treat the ones you care about! Here are a few little things I think would be great for your girlfriends, mom, or sister! What are you gifting on Valentine's Day? Let me know in the comments! Valentine's day is a great excuse to do DIY projects. Whether you are hosting a girls night in, creating a gift for your Valentine, or you just want a snack these are my top Valentine's Day DIYs that you must try out! Food | You can't go wrong with a great Valentine's day treat. Here are two options that are super easy! The first one is to create Oreo sprinkle pops. I suggest covering your Oreos in chocolate then dipping them into your choice of sprinkles. These will make a great little treat to give to friends or to enjoy yourself! Also, strawberries are a great option for Valentine's day. 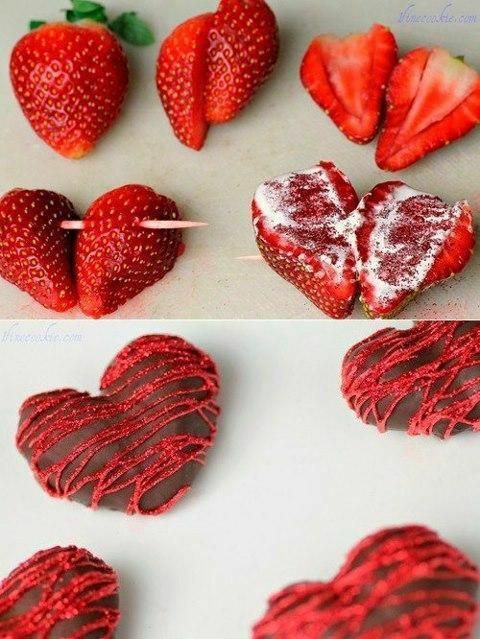 Follow the steps in the picture to create adorable heart strawberry treats! Gifts | These are two great simple gifts to give your Valentine. Create a coupon customized to your sweetheart. Include things like taking them to dinner at their favorite restaurant or having a movie night in. 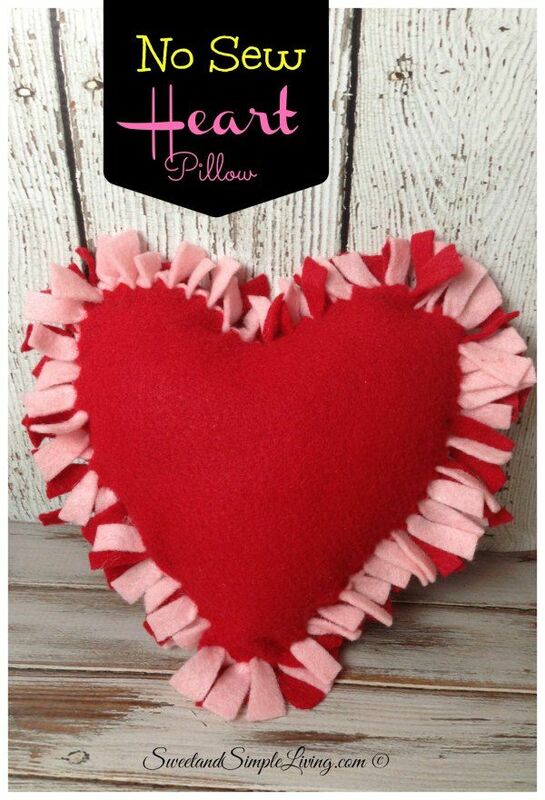 Another great and easy gift to make is a no-sew pillow. I used to make these all the time for gifts! This heart shaped one is adorable. This would make a great gift for a friend or your Valentine. Decor | This Banner DIY is beyond adorable! Creating a burlap and painted banner is a perfect way to spice up your house, dorm room, or apartment. To make the banner more subtle use colors other then red or pink. What are your favorite DIY projects? Leave links in the comments I would love to see them! It seems like just yesterday we rang in the new year of 2015! But, this year is already flying by. I wanted to share a few of my favorite things from the year so far. Although its only been a month, I can already tell things that I will be using all year long! Vineyard Vines | Recently I picked up some great items from the Whale of a Sale on VV's website. Also, I got a lot of items for Christmas. So, I find myself constantly gravitating towards these pieces. From comfy t-shirts, my new shep shirt and fleece vest, and my fabulous hats I can't get enough of Vineyard Vines this year. KJP bracelets | For Christmas I received two KJP bracelets. I have to say, I wear them basically everyday. 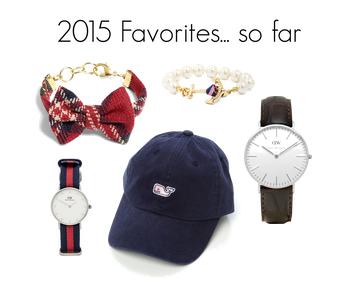 They are so classic, preppy, and just adorable! My two bracelets are also fairly neutral so they are great to pair with any outfit. If you don't have any KJP bracelets I highly suggest you pick one (or more) up. Daniel Wellington Watch | Another Christmas gift I haven't taken off is my Daniel Wellington watch. During a holiday deal I got both a leather strap and a nano strap for my watch. So, I switch between a dark brown leather strap and a navy and red nano strap. 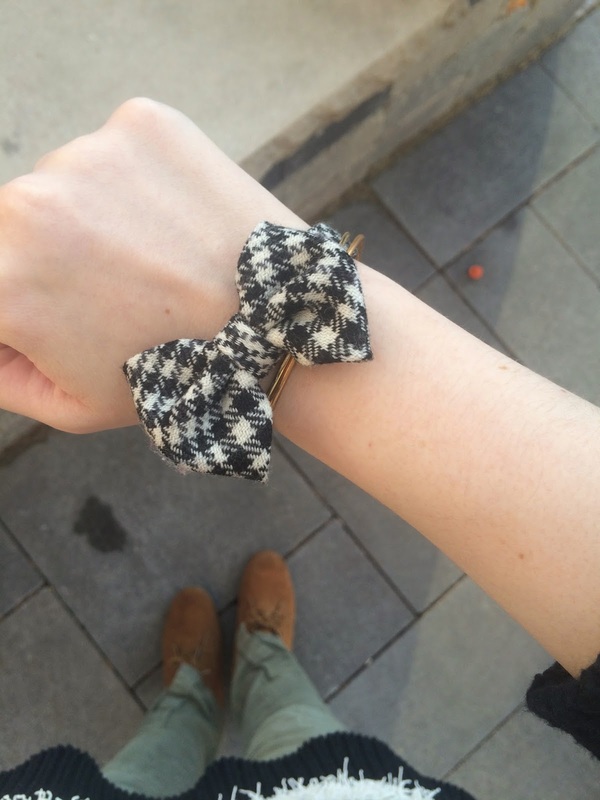 This watch is so classic and goes with everything in my closet! I highly suggest investing in one because it is a great watch. Soft Lips Cube | Now that the weather is terribly cold, I turn to my lip-balm constantly. My current favorite is the Soft Lips cube. This is comparable to the EOS egg, but I prefer this one much better! It is very hydrating and also has adorable packaging. What are your favorites of 2015 thus far? Let me know in the comments! Man Outfitters is a brand new online shop from Grandex! If you don't already know, Grandex is the company that owns the Rowdy Gentleman and Lady clothing lines. I may not be a guy, but Man Outfitters has some pretty awesome stuff. Not going to lie, I may snag a few items from there soon. What can I say, I love wearing guy t-shirts! Also, if I wasn't completely 100% single I would for sure be turning to them to find some great Valentine's day gifts. From random gifts to clothing this place would be a great online site to shop for your man. 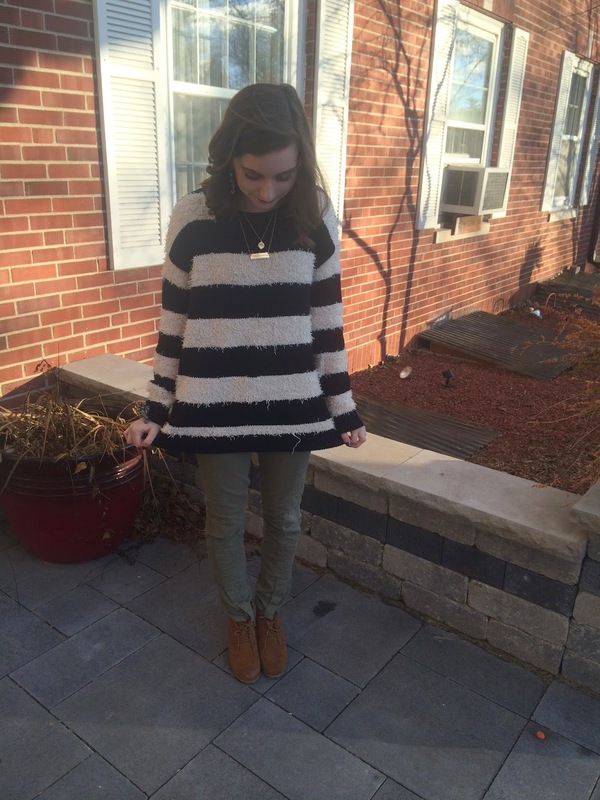 Here are a few of my favorite items from their site! Be sure to check out this brand new site! It's perfect for any guy in your life or for doing some shopping of your own. What is your favorite thing about Man Outfitters? Let me know in the comments! Second semester is now in full swing. Now going on my third week of classes everything is starting to hit me. Between quizzes, homework, club meetings, and a lot of other things! 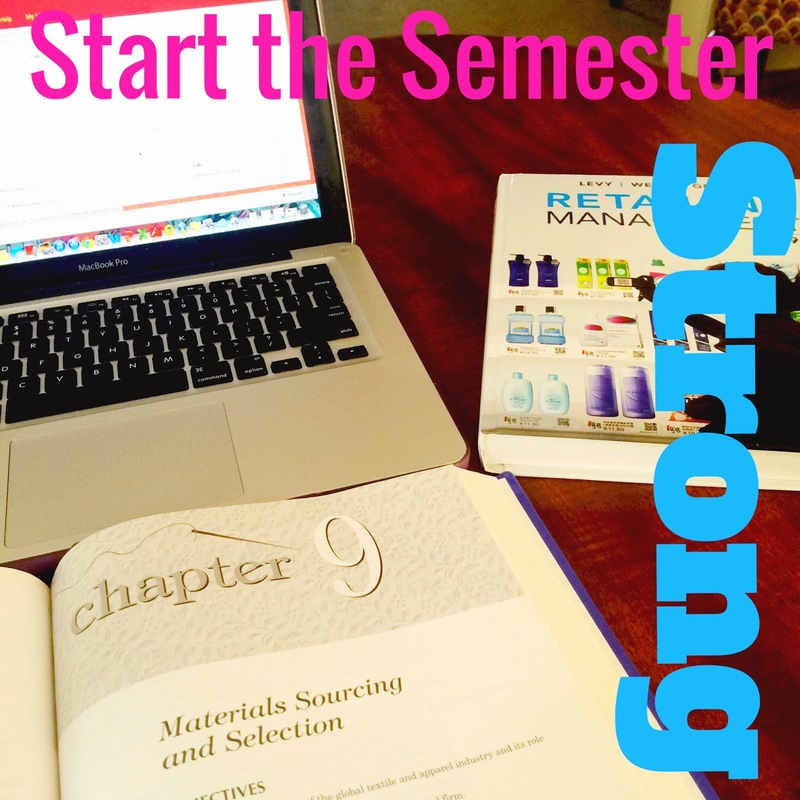 Sometimes starting off a new semester can be tricky. Personally, coming back the first week I was not motivated whatsoever to do anything. I was for sure still in winter break mode. But, now that I have adjusted to school life again, I have a few tips on how to start off your semester on the right foot. Don't procrastinate! I am either an early bird when it comes to assignments or I procrastinate big time. There seems to be no in-between. However, if you start getting in the habit of getting assignments and homework done as early as possible you will be sure for success. If you have quizzes that are due the following week try and get them done on Thursday or even Friday before your weekend plans. There is nothing worse then doing homework on Sunday afternoon. Stay positive. This is hard for me sometimes. Sometimes certain things or instances put me in a bad mood. But, don't get stuck in a funk. By staying positive you can keep a happy attitude the whole semester. There is always room for a few mental breakdowns (we all have them) but try and perk up and think of the positives versus the negatives. Use your planner. My planner is my life. If I didn't write down all of my assignments and meetings I would get nothing done. Utilizing an online calendar, paper planner, or sticky notes on your computer's desktop are great ways to stay organized. If you have a Mac I HIGHLY suggest using the sticky notes. I use these to type of my assignments, meetings, and schedule. This way I can take a quick glance and know exactly what I need to get done. What are your tips for starting off the semester? Let me know in the comments!